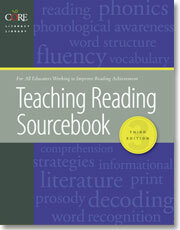 With over 200,000 copies in circulation, the Sourcebook is the essential guide for improving reading achievement by helping educators to bridge the gap between evidence-based reading research and actionable instructional strategies. The Sourcebook supports educators’ efforts to understand, transition to, and unpack, and implement the Common Core State Standards for English Language Arts. The Consortium On Reaching Excellence in Education (CORE) works collaboratively with schools and districts to implement comprehensive, research-based literacy training programs. Call 1-888-249-6155 for information about CORE training. 8 1/2x11, perfect bound softcover, 848 pp.